Stay Powered. Be Supported. Get Ahead. Server Technology’s power strategy experts have provided power solutions for labs, data centers, and telecommunications operations for 30 years. Over 60,000 customers around the world rely on their rack power distribution units and award winning power management solutions to reduce downtime, facilitate capacity planning, improve energy utilization, and drive efficiency. With the best quality, best technical support and most patents, Server Technology products provide uncompromising reliability, innovation, and value for the data center. Founded in 1984, ServerTech, Inc. is a pioneer and leader in Remote Power Management technology, manufacturing a line of remotely addressable power switches called Sentry Remote Power Managers. Available for both AC and DC power supply, Sentry products enable remote power control (off, on, reboot, graceful shutdown) of servers and internet working devices in remote equipment rooms, POP sites, Telco central offices and other co-location facilities. Sentry products are used in data centers, network rooms, switching offices, wiring closets and remote offices locations and are for a variety of applications, including sever management, data center management, backbone equipment and Customer Premise Equipment. 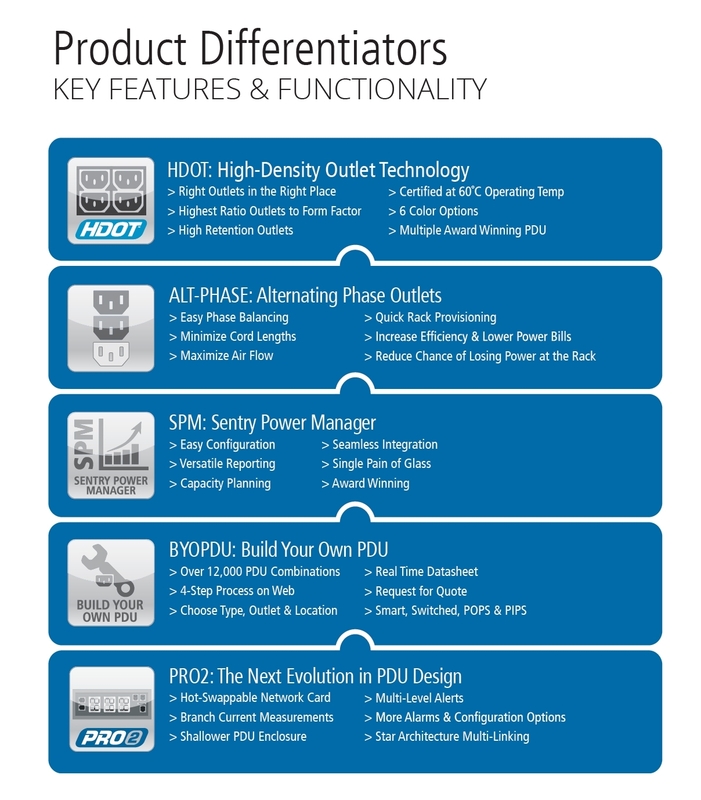 Build Your Own Rack PDU with HDOT Technology. Ask us how! Cabinet Power Distribution with Branch Circuit Protection. Sentry Basic CDU products provide reliable power distribution for all the devices in the equipment cabinet, from 2kW-6kW per cabinet. Available in single-phase 110-120V or 208-240V power distribution with 20A or 30A options and 3-phase 208-240V power distribution with 20A, 30A, 50A or 60A options. Cabinet Power Distribution with Branch Circuit Protection, and Local Input Current Monitoring. Sentry Metered CDU products provide reliable power distribution, from 2kW-22kW per cabinet. Available in single-phase 110-120V or 208-240V or 3-Phase 208-240V power distribution with 20A, 30A, 50A or 60A options. Local input current monitoring allows the installation engineer to verify the aggregate load on the circuit or phase. Cabinet Power Distribution with Branch Circuit Protection, expanded functionality of SNMP-based Input Current Monitoring and Environmental Monitoring. Smart CDU products provide reliable power distribution coupled with remote power & environmental monitoring. Use the network interface to view power, temperature and humidity levels via Web browser, or SNMP-based and email alerts when conditions exceed deﬁned thresholds. Receive SNMP-based or email alerts when power or environmental conditions exceed thresholds. Assign access rights to user groups or individuals. 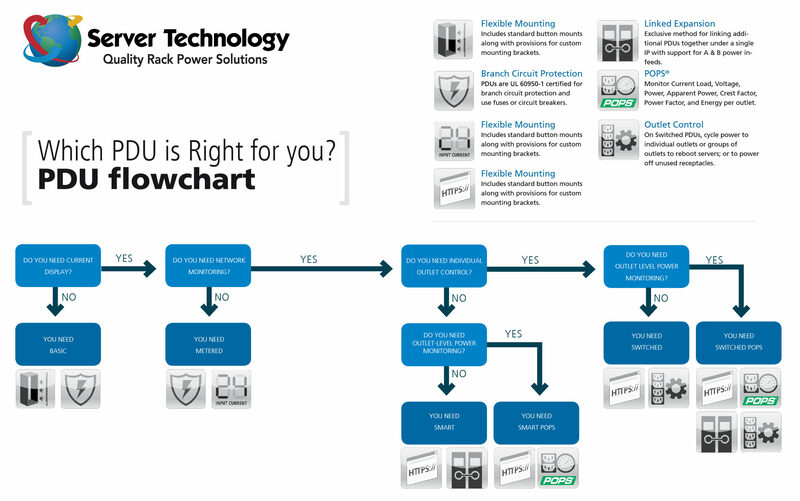 Switched CDU products provide the ﬂexibility needed for all data centers and remote sites, including power requirements for high-amperage and high-voltage, UL 60950-1 Branch Circuit Protection, and SNMP traps and email alerts including current monitoring. Per Inlet Power Sensing (PIPS) is available on select Smart and Switched CDUs. Monitor Current Load (A), Voltage (V), Power (W), Apparent Power (VA),Crest Factor, Reactance, Accumulated Energy (kWh), and Power Factor per inlet. Per Outlet Power Sensing (POPS) is available on select Smart and Switched CDUs. Monitor Current Load (A), Voltage (V), Power (W), Apparent Power (VA), Crest Factor and Power Factor per outlet. DC Cabinet Power Distribution with remote monitoring & management, including remote reboot to connected servers and network equipment. Each power output terminal is protected by a GMT fuse, TPC fuse or circuit breaker, available in a wide range of capacities. NEBS (Network Equipment-Building System) Compliant. Remote Power and Environmental Monitoring of STI CDUs from your Android or Apple device. This App is designed to allow easy access of power, system and environmental information from Server Tech Cabinet Power Distribution Units. No need to connect a computer or physically connect to get information from the PDU when installed in the back of a cabinet. Use of this App requires an external Bluetooth module, version 7.0j firmware on the CDU and the proper auxiliary port. Power Distribution with the expanded functionality of dual A & B input power feeds to supply redundant fail-safe power should an in-feed fail. 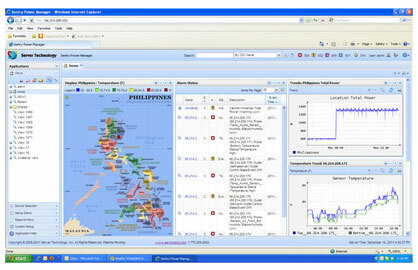 The Sentry Power Manager appliance and software package is capable of monitoring and managing multiple Sentry devices in IP-based enterprise networks. SPM provides a global view of all Sentry CDUs with the ability to view devices based on their temperature, humidity, current and device status. Short on real estate, high on rack components? Choose High Density Outlet Technology. HDOT has the most outlets in a 42U intelligent Rack PDU with industry standard C13 and C19 outlets. Comes with high native cord retention and color-coded alternating-phase outputs for easy cabling and operation to 65C (149F) ambient. Choose Alternating Phase. Alternating phase outlets alternate the phased power on a per-outlet basis instead of a per-branch basis. This allows for shorter cords, quicker installation and easier load balancing for 3-phase rackmount PDUs. Shorter cords mean less mass, making them less likely to come unplugged during transport of the assembled rack. The next evolution in PDU design; with a shallower form-factor, faster processing, and more memory. Your Uptime solution. Award winning, most comprehensive and affordable rack-level solution for measurement and reporting. Your Capacity Planning solution.